You all know how much I love Chaotic Goddess Swaps, right? The ladies that run them do a fabulous job and it's really a great way to meet new bloggers and make new friends. Well, the latest swap is here! 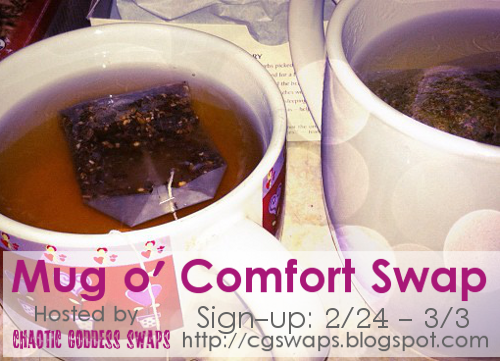 It's the Mug o' Comfort Swap and sign ups are going on now! You send your partner a new mug filled with some goodies to drink in it. If you're a blogger looking for some fun, I highly recommend signing up. This will be my fourth swap and I have loved them all! But hurry because the sign ups close on March 3! Yay for mug 'n' comfort drink fun! :D So happy you're signing up for it.